Vish Puri, the famous detective of India’s ‘Most Private Investigator’ hasn’t been having a good time. His ongoing investigations haven’t been met with any success. To add to it, his biggest rival, Hari Kumar, seems to be doing rather well, indeed, if his clothes and style were any sort of indicator. Puri is about to set off on a holiday or rather a pilgrimage with his family, to Jammu, to visit the famous Vaishnu Devi Shrine. Unlike most people, Puri hates going on holiday, or taking a break, but is finding it tough to wriggle out of this one. Even his secretary is determined to send him on a break. Ram and Tulsi a love-crossed couple. Their families are dead against their union because they are both from different castes. Ram is a Dalit, and Tulsi’s high caste father would rather see him killed than married to his daughter. One day before they were supposed to get married, Ram disappears and it fell to the Love Commandos to trace him down. Love Commandos are a group of people in India, who help couples who are ostracized and threatened by society for falling in love with someone from a different caste. They help couples get married, and even change names in some cases when their safety be compromised. It is a dangerous thing to do, falling in love, when it could result in death. Ram and Tulsi had approached the Love Commandos for help. 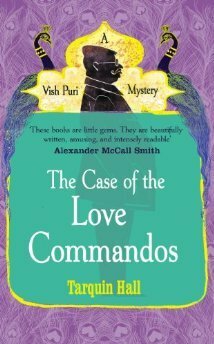 When Ram mysteriously disappears, Laxmi, the Love Commando who was protecting Ram and Tulsi, knew she had only way to go. Vish Puri. Laxmi was also known as ‘Facecream’, a trusted aide of Vish Puri. Puri had been unaware of Facecream moonlighting as a love commando, and her involvement came as a surprise to him. Moreover, he has his own reservations about young people falling in love and chipping away at ‘family values’, but he still agrees to help Facecream out, after all, a mystery is a mystery. And of course, this meant that he could wriggle out of his family trip as well! Puri sets out on the trail, and comes across all sorts of obstacles including his arch rival, Hari Kumar being on the case too. Now, he has to work doubly hard to solve the mystery before Hari does. The case turns out to be far more complex than he thought, but he gets there in the end, of course. It’s a delightfully book, although that’s not something one would say, of crime fiction, but that’s what this book is – delightful! But Puri’s antics and idiosyncracies, make it such a fun read. He fondness of food, as usual, figures prominently in the narrative. Although I have to say, I start craving for samosas or Frankies, whatever it is that he is having. I love the way the author writes. You can vividly picture the lanes of India, flavour of the setting, the people, especially Puri’s wonderfully resourceful Mummyji. Tarquin Hall is a British author and journalist who has lived and worked throughout South Asia, the Middle East and Africa. He is the author of The Case of the Missing Servant, dozens of articles, and three works of non-fiction, including the highly acclaimed Salaam Brick Lane, an account of a year spent above a Bangladeshi sweat shop in London’s notorious East End. 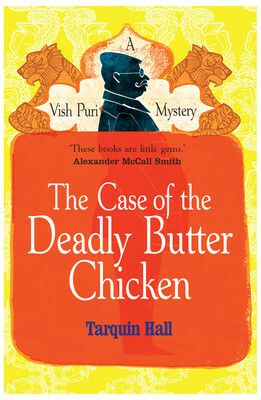 After reading ‘The Case of the Deadly Butter Chicken’ by Tarquin Hall, I started checking out the other books by the author. 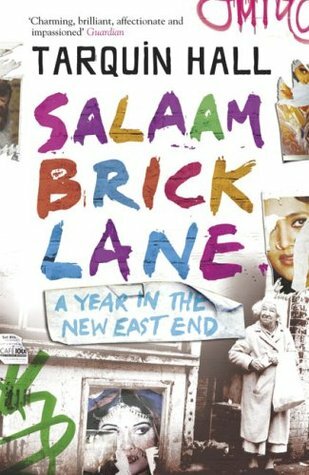 The one which caught my eye was not one of the Vish Puri series, but this one- ‘Salaam Brick Lane’. The fact that it was non-fiction, set in London’s East End sounded very interesting. Tarquin Hall returns to England after 10 years abroad. Returning back he realizes to his dismay that he cannot afford to live in the leafy suburbs of his childhood. He had been priced out of the nicer London areas and the only place he could afford was a tiny, squalid attic, above a Bangladeshi sweatshop in London’s East end – Brick Lane. A place whose reputation precedes it. A place which he hopes is temporary, a place from where he hopes to move from before his Indian born, American fiancee lands in London. Things don’t quite work as he planned, as most things in life. He ends up staying for a little longer than he had planned to. It was not quite the London he had planned to introduce his fiancee, Anu to. Living on a street filled with drug peddlers and prostitutes peddling their fare, it was not quite the London to write home about. And yet, despite the unsavoury characters and the reputation of the place, Hall discovers people and their stories just as any other place in the world. He discovers the world that immigrants have made their own. Some out of choice, some because they donot have a choice at all. East End has a history of having been the place where immigrants have settled and have got absorbed into British Socieity. From the Jews to the latest in the line, the Bangladeshis. It was funny to read how some people who had come to Britain as immigrants now consider themselves British and are ready to campaign against the new immigrants. It was interesting to read how the East End has moulded itself over the years and taken over the characteristics of it’s latest inhabitants while absorbing them into a unique but still British Identity. Hall’s narrative is interesting and non-judgemental and is fascinating read. It has a great set of characters, a lot of variety and their stories bring out a perspective to the East End some of us might have never known about. The life some of the immigrants lead, looked at with suspicion by some, being in a place, they never wished to be in the first place, was an insightful read. For others it was still a life much better than the one they left behind in the countries they came from. He adds in his personal story as well, which just adds to the flavour. His life with his fiancee, who is initially horrified by their surroundings(being mistaken for a prostitute doesn’t help, I’m sure!) but slowly comes to terms with Brick Lane, warts and all. As they chart their lives together, Brick Lane provides a fascinating backdrop in it’s character and colour. An intriguing narration of life as an East Ender by someone as far removed as possible from it, someone who has had a privileged upbringing, in London suburbs which are as different as they can be from London’s East End. For me, it was full of insights and bits of history, which I found very interesting. An account of London’s immigrant hub, so to speak which seemed to have been the place immigrants have always migrated to. A place which has sheltered them and taken on their idiosyncracies and flavour, transforming into Jew town when the main immigrants were Jews and now, in it’s latest avataar, Banglatown. Who knows what it’s future holds, but whatever it might be, East end promises to be interesting and vibrant. All in all, a great read. It’s a 4.5/5 from me. I have to say, I enjoyed Hall’s non-fiction a lot more than his fiction(I’ve just read one). This book was recommended by Smita and Pixie, and luckily for me, I found it in my library, that very day! That never ever happens to me! I picked it up only to realize that it was the third of a series, but that didn’t retract in any way from the book, I have to say. Vish Puri is the famous detective, who has been solving mysteries while gobbling up delicacies of all sorts. He is extremely fond of food, butter chicken is one of his favourites, and he tucks in, albeit surreptitiously to avoid his wife when he chances upon a mysterious meeting with two individuals, one of whom ends up dead on the floor as soon as he eats the butter chicken, Puri had just enjoyed. The dead man is the famous Pakistani Cricketer Kamran Khan’s father. Vish Puri ends up involved in the case, but of course! And eventually solves it with the help of his Mummyji, who despite her son’s pleas refuses to accept that detective work is not for mummies! It’s a fun journey with Vish Puri as he goes about his job, eating his way through situations. The author does an incredible job portraying India, it is as if we are there. His words transport you to the places, the alleyways and the journeys that protagonists embark on. It was all spot on. The mystery was well handled, and the suspense was maintained well. So would I recommend it? It’s an interesting book, for sure. The story as well as the setting is well etched out. Keeps you engrossed, a complete page turner. I have to say that if I have to choose a favourite character, it would the feisty Mummyji! I absolutely love her! She was so much fun! If the other books feature her as well, I’m definitely picking them up. Some of the things that niggled at me was the use of Indian-English. Don’t get me wrong, I’m all for using the local language, but I felt that in some places, it felt forced, didn’t feel natural. As if the author was trying too hard. Either that or I’m out of touch with India. Might be the latter, if I’m honest. I wasn’t too taken by the secondary plot of the missing moustaches. The book would have been just as great without it, in my opinion. But these are minor quibbles at most. I would rate it a 3.5/5. And before I forget, I found a non-fiction book by the same author which feels like something I would love to read! And what makes it doubly exciting is that I have gotten hold of it too! It’s just waiting to be read, as soon as I finish the one I’m currently on. This book is available from Amazon(UKand Flipkart(India).